By now you know that KiDs Beach Club® gives a KBC Explorer’s Study Bible to every child in every Beach Club. Many of you help in this effort with your monthly donations. Some of you even help in the distribution process as a Beach Club volunteer. During the last school year, KiDs Beach Club® handed out more than 8,300 Bibles. In the 10-plus years KBC has been giving out Bibles, more than 40,000 kids have received a Bible. For many of them, it’s their first. Only 38 percent of children who enroll in Beach Club claim to have a church home on their permission form when they start club. Sixty-two percent do not! So, for most, not only might the KBC Bible be their first, it might also be the first Bible in their home. The KBC Explorer’s Study Bible is designed to be easy to read. One dad of a Beach Club kid asked the principal at his child’s school where he could get a copy of a KiDs Beach Club® Bible for himself. He said his son had one and it seemed easy to read. The principal suggested that he sit with his son and read it together. He was surprised that he hadn't thought of that and now they read God’s word together. KiDs Beach Club partnered with publishing company Tommy Nelson to create the KBC Explorer’s Study Bible, which is handed out on Great Treasure Day, the fifth week of Beach Club. “This Study Bible has been richly enhanced by the four-color cover designed by KiDs Beach Club as well as the insert pages interspersed throughout the New King James Explorer’s Study Bible,” said Dana Long, a Bible designer at Tommy Nelson. The special features of the KiDs Beach Club® Explorer’s Study Bible include Word Decoders, which are a compass to the meaning of Bible terms; Discoveries, which allow readers to experience living in Bible times; Bible Treasures, which helps readers learn wisdom from the lessons learned by Bible characters; and Digging In, which allows readers to find rich treasures in story backgrounds, the meaning of key passages and more. There is also a full-page spread highlighting the great commandment and another for the great commission. 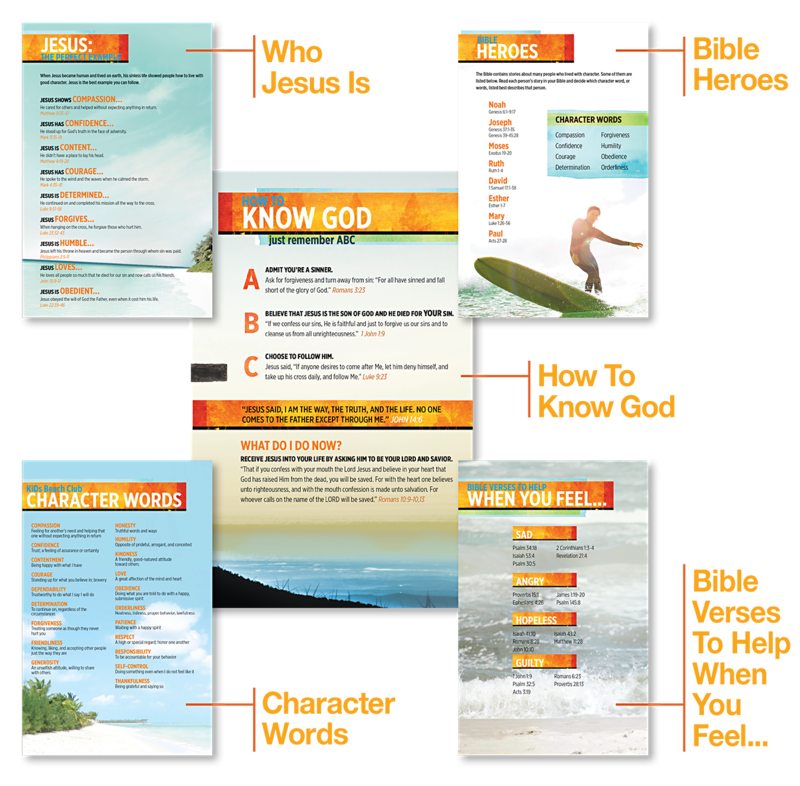 We have put all the insert pages on our website and hope you will take the opportunity to learn more about the Bible your helping to put in the hands of children. Thank you for your continued support of the Bibles for Beach Club program. If you are interested in becoming a monthly Bible donor, please visit: kidsbeachclub.org/bibles.